It’s becoming increasingly common for builders to install one or more layers of rigid foam on the exterior side of wall sheathing and roof sheathing. Typically, these walls and roofs also include some type of air-permeable insulation (fiberglass, cellulose, or mineral wool) between the studs or rafters. 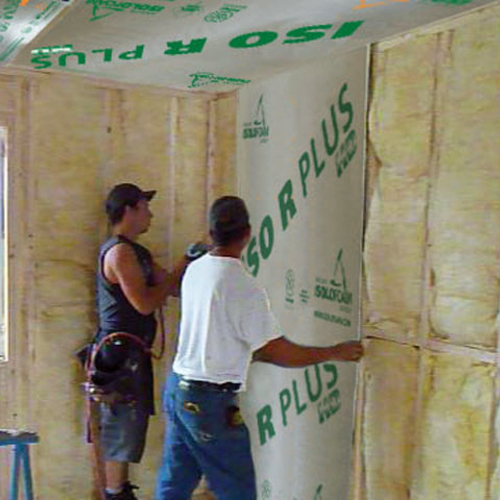 To prevent moisture accumulation, cold-climate builders need to install thicker rigid foam than warm-climate builders. So the minimum R-value of the exterior rigid foam in these assemblies varies by climate zone. Guidelines for roof assemblies aren’t the same as guidelines for wall assemblies. Why? Because (due to the stack effect) roof sheathing is at greater risk for moisture accumulation than wall sheathing. Moreover, because of nighttime radiation cooling, roof sheathing gets colder at night than wall sheathing, increasing the chance of moisture accumulation in the roof sheathing. These facts lead to more conservative guidelines for roof assemblies than those used for wall assemblies. What about walls with above-code levels of insulation? Thanks for an excellent article, Martin. These are helpful guidelines. I wonder if the bent aluminum at the bottom of the foam should end behind, instead of in front of, the vertical furring strips? Since that gap provides a vented rainscreen, do we really want water that gets past the siding and runs down the drainage plane to collect on the aluminum at the bottom? As drawn, the aluminum appears to be like a "gutter" in which water would pond. It certainly makes sense to provide an air inlet at the bottom of a rainscreen gap (to encourage ventilation drying). While large amounts of liquid water in a rainscreen gap are rare -- usually, a few drops of liquid water collect there, and the water evaporates quickly, whether it drains or not -- it also makes sense to allow drainage at the bottom of a rainscreen gap. These issues are addressed in my article, All About Rainscreens. In many areas of the country, builders are using perforated J-channel to trim the bottom of their rigid foam (and to flash the bottom of their rainscreen gaps). A photo of perforated J-channel was included in my "All About Rainscreens" article; I will reproduce the photo below. Concerning the errors in the drawing chosen to illustrate this article: I don't have a budget that allows me to commission original drawings for my weekly blogs. So I have to make do with illustrations from a variety of sources. Sometimes these illustrations are imperfect; I do the best I can, and (usually) I don't make the drawings myself. Thanks for your comments. I appreciate this discussion, which is valuable. Another advantage of the flashing Martin included above is that it provides a level guide for the bottom of the rain screen furring. The installation is very quick. Excellent responses, Martin and Malcolm. The drainable J-channel is a good innovation. I have seen homes with vinyl siding and serious sheathing decay beneath due to poor detailing of J-channel, leading to water-entrapment behind the siding. Understood about budgets and illustrations. An excellent, helpful post — thanks again! Zip-R is sold with one inch of foam between the studs and the sheathing and is adhered to the sheathing. In Zone 5 with 2x6 walls that would not be nearly enough foam if the foam were outside the sheathing. Is this a safe product? Would it work if the builder installed the foam inside the sheathing instead of buying the proprietary product? I am currently wrapping up a home in northern Vermont (zone 6) with an exterior foam assembly similar to the detail shown. Four inches of polyiso over 2x6 wall with dense pack cellulose. I am finding the moisture content of the sheathing much higher than I expected. Generally it is 10 - 13% with some areas as high as 16%. Surface temperature of the sheathing is almost as warm as interior ambient temp. Since the wall framing was panelized the building went up fast and stayed relatively dry. The slab did spend a lot of time in the rain. Any thoughts if these heightened moisture levels are a cause for concern or just a first year occurrence? I am thinking (and hoping) the latter. The drainable J flashing is a fantastic idea. It could of simplified a lot of our rain screen detailing. You report that "Generally [the sheathing moisture content] is 10 - 13% with some areas as high as 16%." Congratulations. Your wall assembly is working well. Most wood experts don't get concerned until moisture contents rise above 20% -- and even if the MC rises above 20%, that's not necessarily a problem, as long as the sheathing can dry out later. What makes you think that 16% MC in winter is concerning? If this is a new house, you are correct that your concrete slab is probably contributing moisture to the house. Moisture of construction can easily cause elevated indoor humidity levels for at least one year, and sometimes two years. By the way, what type of equipment are you using to measure the MC of your sheathing? As you may know, these types of measurements are notoriously tricky and prone to error. There are two versions of Zip-R sheathing: a thin version rated at R-3.6, and a thicker version rated at R-6.6. I consider these building materials to be warm-climate materials. You could use the R-6.6 in Climate Zone 5, I suppose, but only for a 2x4 wall. Its R-value is too low for a 2x6 wall. Even though the foam layer of Zip-R sheathing faces the interior, the same rules that I set out in this article still apply, because you don't want condensation on the interior surface of the rigid foam layer. If the interior relative humidity of the house is high enough, and the outdoor temperature is low enough, you can get that type of condensation on the interior of Zip-R sheathing -- leading to puddles on your bottom plate. It's not worth the risk. Q. "Would it work if the builder installed the foam inside the sheathing instead of buying the proprietary product?" A. Your question is confusing. 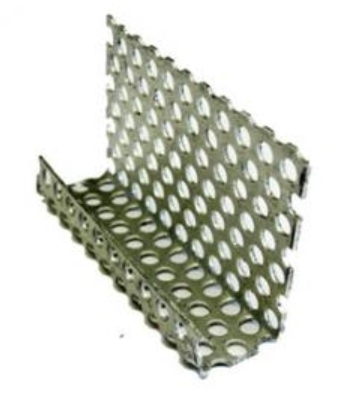 Are you suggesting a type of wall assembly with rigid foam on the interior side of the studs? (If so, read this article: Walls With Interior Rigid Foam.) Or are you suggesting a type of wall assembly with rigid foam that is sandwiched between the studs and the exterior OSB sheathing? If the latter, you had better talk to an engineer before proceeding -- because OSB sheathing can't be depended on to brace a wall properly unless the OSB is nailed directly to the studs. If you have an alternative bracing plan (perhaps involving diagonal steel strapping or 1x4 let-in braces), that approach might work -- but check with an engineer. Thanks Martin for your insight. I was concerned with the 16% MC because the interior RH is what I would consider dry. The house is still uninhabited and the ERV system has been running for several months keeping the interior RH below 35%. My paranoia is that it could approach 20% once the house is occupied and moisture loads increase. Most likely it will decrease over time. 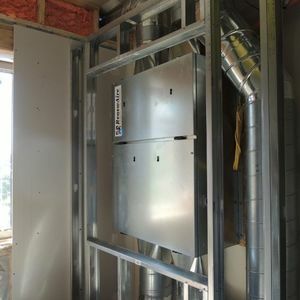 I am currently working on house with a DP cellulose double stud wall and interior "smart" membrane. It will be interesting to compare the sheathing of the two. The equipment I am using is a Delmhorst meter with custom made long probes. I was not aware of potential inaccuracy of the equipment. I have always been comfortable with the accuracy, at least for my needs. It is a great tool to find my own mistakes. Seven years ago I built a roof assembly without enough exterior foam (2x10 DP Cellulose w/ R15 exterior foam). This time of year the sheathing is well over 30% MC. I have opened the cavity up for inspection. The sheathing is definitely wet but no sign of mold or even raised grain on the sheathing. We will see if it lasts another 7 years without damage. Zip-R combines a layer each of OSB and polyiso insulation. It is designed to install foam-inward, with the OSB facing out. The foam is between the OSB and the studs and it does have some impact on the structural properties of the OSB. Huber's engineering is embodied in the ICC-ES Evaluation Report and the instructions for the material. Among other things, you have to fully sheathe all walls (can't use the product for just corners with foam board infill, as is sometimes done with regular OSB), and use nails spaced more closely. It would be smart to consult an engineer if you used your own foam board & OSB combo, but Huber has done the engineering for some basic installations of Zip-R. Thanks for providing further information on the implications of the studs / rigid foam / OSB sheathing approach. I would like to suggest that the exterior foam discussed might be better to be mineral wool instead. 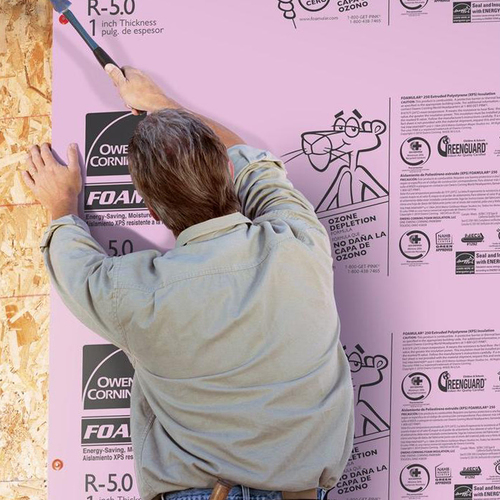 The Roxul ComfortBoard IS is what I used in my house last year since not only does it provide insulating R-value, but it it is breathable and dries so there isn't any trapped moisture. Additional benefits are that it is isn't petroleum-based and doesn't have chemical flame retardants (as it isn't flammable). I did two layers: a 1.5" layer and a 1.25" layer for a total R-value of 11. The subject of this article is a specific type of wall -- one that includes exterior rigid foam. GBA has many articles that discuss other types of walls, including walls with exterior mineral wool. For example, see this recent article: How to Design a Wall. That article has a section describing walls with exterior mineral wool, and in that section I include links to three more GBA articles on the topic. Sorry, I took the article to be wall design with exterior insulation in general. No problem. To respond to your original comment: You're right that there are many advantages to installing mineral wool insulation on the exterior side of wall sheathing (as I pointed out in the "How to Design a Wall" article). It's just hard to include all information about walls in every wall article... so in this article I narrowed my focus. In a 3C zone, 2 X 6 wall, cellulose cavity insulation, 1/2 OSB or ply, 1" rigid foam exterior, my question is about the the placement of WRB. If it were a product like Henry Blue skin, could it go on the exterior face of the foam? This would be the air barrier as well. Your WRB can be between the OSB and the rigid foam, or it can be between the rigid foam and the siding. The choice is yours. Just remember that all of your wall flashing needs to be integrated with your WRB. Depending on your flashing plans and window location, you may prefer one approach over the other. For more information on this issue, see Where Does the Housewrap Go? I plan on installing exterior rigid insulation on our new house we are building. The only problem is I didn't learn how important this was until after we had the windows already framed, and not with window bucks. The windows are already ordered too. Is there any recommendations on preparing the window for exterior insulation after the framing is set without allowing for the 3/4" needed for the buck? There are many ways to proceed. You can install the windows as innies, or install a "picture frame" of furring strips around the window opening if your foam isn't too thick. For more information, see Installing Windows In a Foam-Sheathed Wall. I am planning on redoing my roof as it is in need of it. I thought it would be a great way to add some insulation to the roof deck. I currently have a cathedral ceiling with a Rafter space of 17 inches with a combination of 4x14 rafters 4' oc there are 2x4 that run perpendicular to the rafters which stand off another 2" of the 4x14 with some 2x4 to expand that space. with Sheetrock attached to the perpendicular 2x4. This make up the rest of the ceiling system. This space is filled with what looks to be at least R-35 Kraft faced fiberglass insulation. But with the space that is available it could be larger than that potentially up to R-40 or close. My plan was to put a ice and water product and then a layer of R-10 EPS or XPS install furring strips on top of the foam and then a standing metal seam onto of that. My first question would be Would that create a double vapor barrier EPS and then the Kraft Faced vapor retarder? b/c I would not think of ripping our my ceiling to replace the Kraft faced vapor retarder should I give up on the idea? b/c trapping moisture in there is really bad. 2nd. Would I really need the 51% of my insulation to be Rigid on top of the roof deck or is anything I put up there better than leaving it at just the craft faced with the new metal roof? 1. Can I attach the siding directly through the foam or will I need strapping? 2. If I need strapping, can I get away with placing the foam between the strapping? 3. If I can only manage 1" of foam (assuming R-6) that works out to 35% of the total R-value, is that 1% flirting with danger? 4. No matter what I do I'll be close to the line, so should I consider xps in that it outperforms polyiso at cold temps? My first reaction to your question is that you should hire an experienced contractor capable of packing out the gable-side (rake) overhang. If I were doing this, I would attach new rake boards (perhaps a 2x6, followed by wood or PVC rake trim) to the rake, and I would finish the top of the new extension with metal flashing. 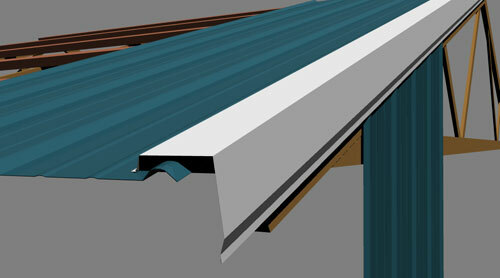 You could use metal rake flashing sold by metal roofing suppliers (see illustration below). In this way, you can extend the roof overhang on the gable side. Q. "Can I attach the siding directly through the foam or will I need strapping?" A. You'll need to check the installation instructions provided by the manufacturer of the fiber-cement siding. In most cases, you'll need furring strips. Q. "If I need strapping, can I get away with placing the foam between the strapping?" A. That's not desirable. One of the main advantages of exterior rigid foam is that it forms a continuous layer of insulation, interrupting thermal bridging. Q. "If I can only manage 1 inch of foam (assuming R-6) that works out to 35% of the total R-value, is that 1% flirting with danger?" A. For a thorough discussion of that question, see this article: Rethinking the Rules on Minimum Foam Thickness. Q. "No matter what I do I'll be close to the line, so should I consider XPS in that it outperforms polyiso at cold temps?" A. If you don't want to use polyiso, you might consider the use of EPS. Like XPS, EPS has improved performance at cold temperatures. For more on this issue, see Choosing Rigid Foam. Q. "Would that create a double vapor barrier (EPS and then the kraft-faced vapor retarder)? Because I would not think of ripping our my ceiling to replace the kraft-faced vapor retarder. Should I give up on the idea? Because trapping moisture in there is really bad." A. The kraft facing is a smart vapor retarder with variable vapor permeance. It is not a vapor barrier. So the presence of the kraft facing does not increase the risk of this assembly in any way. Q. "Would I really need the 51% of my insulation to be rigid foam on top of the roof deck? Or is anything I put up there better than leaving it at just the kraft-faced fiberglass with the new metal roof?" A. Yes, you really need to follow the rule about minimum rigid foam thickness. Here's the reason: you are changing your existing vented roof assembly into an unvented roof assembly, and so you need to make sure that your new roof assembly isn't at danger of moisture accumulation. (Since your current roof assembly has a ventilation channel between the top of the fiberglass batt and the underside of the roof sheathing, it has a mechanism to handle moisture -- a mechanism that will disappear once you create an unvented roof assembly. I'm assuming that such a ventilation channel exists, because it is a code requirement.) When you add the rigid foam above the roof sheathing, you'll need to seal up the ventilation openings. So you'll have to follow the 51% rule to avoid problems. I would recommend considering 1" of mineral wool boards instead of foam boards. Because they have high vapor permeability, you don't need to worry about minimum thickness. I am working with an experienced contractor who I have full faith in as this is our second major renovation together. His experience is broad and deep and he is always up for problem-solving. However, his expertise is not specifically in the green building field and when needed I take on the role of researcher before we make final decisions. We had already considered packing out the gable end and installing a wider drip edge, but neither of us was keen on pulling up existing shingles. Am I correct that the metal rake flashing installs over the existing shingles? That would solve the shingle problem and I presume it would be installed using some type of seal sealing fastener, correct? This may just be our answer. Thank you. Thank you for the suggestion. I like everything I've seen about mineral wool, but have yet to have the opportunity to use it. This may be the time. If you take my advice and pack out the rake, you should install peel-and-stick flashing (rubberized asphalt like Grace Ice & Water Shield) to cover the joint between the shingles and the new rake board, and you should fold the peel-and-stick flashing over the corner, so that it extends vertically onto the new rake boards. Then install the metal rake flashing to cover the peel-and-stick. As stated in my original question (#21), the existing interior fiberglass batts are foil-faced. Does the presence of the foil present an issue for adding exterior foam (or alternately Roxul)? 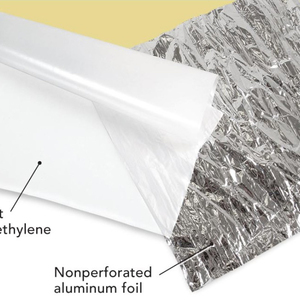 The foil facing is a vapor barrier but not an air barrier. The role of the foil facing in this assembly is complicated; while the foil facing reduces outward vapor diffusion during the winter -- a good thing -- it also reduces inward drying during the summer -- not always good. On balance, it is my judgment that you don't have to worry. You can proceed with your plan to install a continuous layer of exterior insulation. For a thorough discussion of this issue, see Rethinking the Rules on Minimum Foam Thickness. I am building new in the gulf islands of southern BC, and have gotten great advice from GBA on the cathedral roof. I will be using 7 inches of EPS insulation R28 on top of my roof deck which currently has an impermeable peel n stick in place. It has been great and kept my framing dry even with the ton of rain we have had in November! It may be a few months (Spring) until I get the EPS foam and steel roof on top of my plywood deck. However, I was contemplating firing up my main floor wood fireplace and /or my basement propane fireplace to take the chill off while working inside during this winter. It rarely goes below freezing but the dew point can be 5 or 6 degrees C and I am concerned once the fireplace goes out that the roof deck will radiate heat rapidly and cause interior condensation or rain on the interior side of my deck plywood inside my assembly. I was also wondering if I installed supplemental fiberglass batts @ R20 or R28 directly underneath the deck right now as opposed to after the exterior insulation goes on if that would help or even just trap more moisture? I guess I was wondering if I might have the same issue with the exterior walls, about half of which have been insulated with Roxul. I used Henry Blueskin VP 100 as a fully adhered exterior house wrap. Many thanks in advance for any advice. 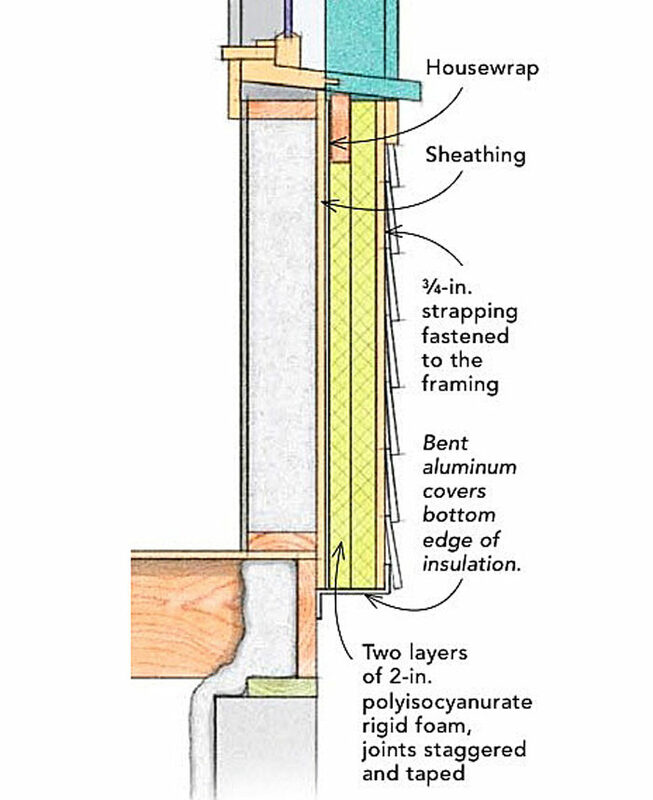 Uninsulated framing bays are less likely to have condensation than insulated framing bays (especially insulated framing bays without drywall). If the house alternates between heated periods and unheated periods, it wouldn't surprise me if the uninsulated framing bays get a little damp as the house cools off. But firing up the heating system will dry things out quickly. If you've already installed mineral wool insulation in some of the walls, things get a little tricky. Lots of GBA readers have reported damp sheathing behind the fibrous insulation in circumstances similar to yours. The best way to prevent problems is to hang the drywall immediately after insulation is installed (to reduce the chance that warm, humid interior air has access to the cold sheathing). What is the proper insulation to use on the interior of the rim joist with rigid foam on the outside preventing drying outward? Such as in the above illustration. You can use a variety of insulation materials: fiberglass batts, mineral wool batts, rigid foam insulation, or spray foam insulation. 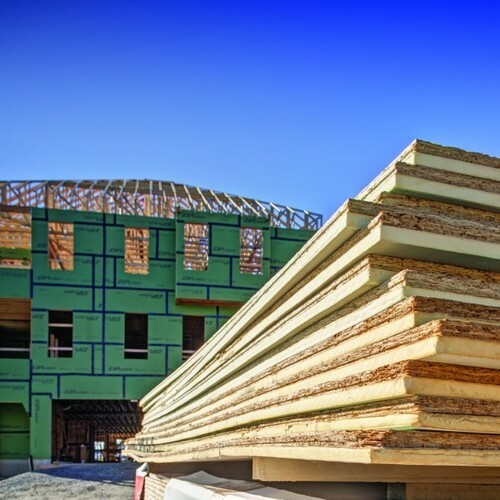 Researchers who have measured the moisture content of rim joists with rigid foam on both sides haven't discovered any problems -- the moisture content of the rim joists isn't worrisome. Thanks for info, my only concern is the sill is directly on the block foundation. Wont this draw moisture and not be able to dry with foam exterior and ccspf on interior? Building codes require the use of sill seal (a capillary break) between a foundation wall and the rim joist. If your builder forgot the sill seal -- a possibility if you are living in an old house -- you have to worry about the rim joist wicking moisture from the damp CMU wall. If that's the situation you are facing, use a vapor-permeable insulation on the interior (fiberglass batts, mineral wool batts, or open-cell spray foam). Yes it was built in 1956, no code or permit required at that time in this part of NY. Thanks for verifying, as long as I air seal from the outside I think I should be fine. Still a few details to work out. I am new to learning more about building science and maybe there is an article already published about this. My question is if you used spray foam insulation under the roof sheathing between the rafters and then added foam board on top of the roof sheathing do the ratios in the roofing table need to remain the same? I have a house that I need to re-roof and I was thinking of adding foamboard insulation. Eventually I was thinking of spray foaming the attic on the underside of the roof sheathing to add more insulation. Is this feasible? Q. "If you used spray foam insulation under the roof sheathing between the rafters and then added foam board on top of the roof sheathing, do the ratios in the roofing table need to remain the same?" The more nuanced answer is as follows: You definitely don't have to worry when the interior insulation is closed-cell spray foam, since closed-cell spray foam is vapor-impermeable. 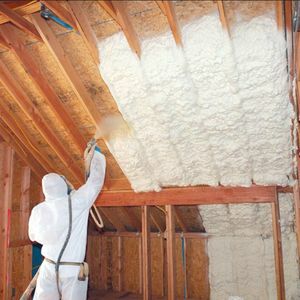 But you might want to at least think about the issue if the interior insulation is open-cell spray foam, since open-cell spray foam is vapor-permeable. That said, the fact that open-cell spray foam is an air barrier greatly reduces the amount of interior moisture than can reach the sheathing, so the type of roof assembly you describe is generally safe. If you haven't done any of this work yet, I would advise to to try to install as much exterior rigid foam as you can, with the goal of hitting the ratios shown in this article if possible. That will keep your sheathing warm and dry -- always a good goal.